It came to mind as I made two blocks from Lucinda Ganderton’s book, Block a Day. I decided to use some of the pretty bird fabric that I purchased on a whim. I made a mistake, so I added border to make a 12.5 inch block. Yesterday, I was able to complete the piecing of the bottom half of the Tribute quilt. Today, I connected the two sections. Now, I am trying to decide if I should had a pink border, and then a purple binding; or just the purple binding. I am waiting for B&B Quilt Shop to return my call concerning the pink and purple fabric I ordered. My mother belonged to a sorority that raised funds for St. Jude’s Hospital. A friend of mine has a granddaughter who is a cancer survivor. Their family has nothing but praise and gratitude for St. Jude’s Hospital. A hospital spokesman responded to my inquiry about donating quilts. “All items must be new, clean and must have been knitted or crocheted in a pet free, smoke free environment. If anyone is interested in donating quilts, made under these conditions, I can send you the address. These are the quilts that will be donated. This cute little sewing box was a gift from two special people. As you can see, I am back in my sewing room. I am cleaning it up today and will get back to working on the Tribute quilt. In 1976, I lived in Georgetown, Texas. I loved living in this small, Texas town. This afternoon, I revisited Georgetown with my friend Nancy. Even though the city has grown, it still has the charm of the old town I knew. We stopped by Poppy Quilt & Sew . I found fabric for the Transformer quilt I am planning. The white fabric is Compositions Grid. The black fabric is Texture Graphix-Vertical. The gray fabric is Texture Graphix-Salt and Pepper. 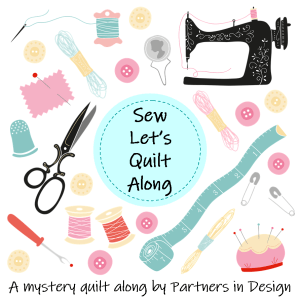 Conversation and Quilting…what a great way to spend two days! Last night was a beautiful night spent visiting with my oldest twin son. He was in Austin for a conference. Nothing better than having conversations with my sons! Then, today was a great day spent with friends. Lunch, positive conversation, and sharing of ideas. We also planned our continued effort to get our voices heard over in Austin, with our state legislators. All this conversation energized me to get to work. I returned home ready to take the next steps for completing the Tribute quilt. Yesterday, I made the final nine-patch squares and strips. I also framed the fourth row, which has the center block that represents mom’s house. The movie fabric I had ordered was delivered today. It is not quite what I expected, a little too dull. I made Block #150, Octagon Frame. I haven’t decided if I want to use it in the quilt. Tomorrow may be the last day I have time to work on the quilt for this week, so I will decide on the block tomorrow. I’ll be taking a few days off to spend more time having conversations with friends! Today I took a break from working on the Tribute quilt. Instead, I made Block # 243, Four Ways. I decided to use this block to make a tote bag for myself. I had enough polka dot material for the arrows and the lining. I added a border in order to fit the size for the messenger bag pattern. There was enough denim left over for me to make the bag. Yesterday’s visit to the Quilt Market inspired me to get to work. Today, I was determined to finish adding the vertical sashes to the remaining four rows. I spent the morning cleaning up and redoing some blocks, and adding border to others. There is one block that I want to replace, but I am waiting for the fabric I ordered. In the meantime, I will finish making the 9-patch squares that I need. I will also start adding the vertical sash to the rows that are completed. The pink and white vertical sash for the four inner blocks still needs to be pieced. But I will wait until tomorrow. I have surpassed my limit for today. Jeana, from Busy Bee Quilting, told me that she would be at the UUMC Quilt Guild 2017 Market today. It was time for me to visit another quilting show, so I drove over today. It was difficult finding parking, there were so many people there. Francine Pons, from Las Colchas was also there. And, I also ran across a friend who attended elementary school with me. Eileen has been quilting for years and she belongs to the UUMC Quilt Guild. It was fun seeing old friends and meeting new people. There were quite a few vendors there with beautiful fabric. I also saw so many creative ideas for quilting. Most of my time was spent looking at the quilts on display. This afternoon, I got back to work on the Tribute quilt. I skipped to row 6, since I am waiting for fabric for a block on row 5. I also made a new block for row 6. Instead of using Kew Garden, Block #29, that I had made, I decided to make Block #308, Garden Path. I was never really happy with the color combination on this block. It was also 1/4 inch shorter and I was going to have to redo the side seams. This block is a lot brighter and happier. I do not like to make flying geese, but it is getting easier to make them. I decided to use the rotary method for making the diamond square. The templates I had made were no where to be found. I will add this block and the Christmas block to row 6 tomorrow. Today was a day of errands that ended up being a day of goodies. We happened to be near JoAnn’s, and I happened to have my coupons. I told my husband we would just take a quick walk-through to see if anything called my name. Well, I heard my name. I found these beautiful bird fabrics. Even though I have no project (s) in mind, I could not pass these up. I was only going to get half a yard, and my husband said to get a yard, so I did! The bonus was the 60% coupon! There are a couple of blocks that I made for the Tribute quilt that I am considering replacing. I love looking through Block a Day. Today, I found Block #360, Tulip Lady Fingers. Mom loved pink tulips, and I had plenty of pink fabric. I had planned to use a garden block that I had previously made, but I was going to have to redo some of the seams. I replaced it with the Tulip Block. The fourth row is now vertically sashed. It is being sashed with pink, in order to spotlight it. I also ordered some fabric from eQuilters. It is a colorful fabric with movie cameras and projectors. The name of the fabric is Let Me Entertain You. Mom loved to watch movies. Her favorite was Random Harvest with Ronald Coleman and Greer Garson. She is my favorite actress, and I must admit, I love this corny movie.